There’s nothing better than passive income. With passive income channels, you’re not limited by how much money you can make because it’s not based on the time you put into it. Imagine just how much a solid and reliable source of passive income could ultimately change your life. You’d finally be able to live the dream lifestyle where you can enjoy time with friends and family while maintaining a viable and consistent source of income. 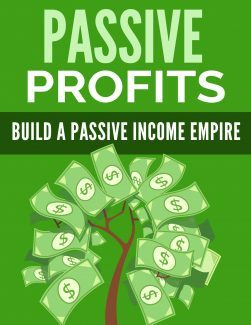 How can I start building unstoppable passive income channels? That’s what this special report is all about. I’ll show you exactly how you can start generating passive income from some of the top hands-free money making opportunities. So, without further delay, let’s begin! Let’s jump right into it by taking a closer look at 2 of the easiest ways of create passive income online. Membership sites require monthly updates so how can it truly be a source of passive income? The truth is, you can create all the content upfront and then drip-feed it to your members so that they are given access to new material every 30 days. Sure, you’ll spend some time upfront getting the membership site ready and creating enough content to sustain members for several months, but once you have laid out the groundwork it can run on almost complete autopilot. Then you can spend whatever time you wish working on new content for a future update. Membership sites can also be set up where it simply provides access to fresh content on a limited cycle, such as a 6-month membership site that ends with a final update. For example, a subscriber would join and be able to access content from month 1. Perhaps this is a series of eBooks, or video training. Then, that subscriber would then pay for access to the second month’s content. Their member’s area would automatically update to include the next month’s content and so on. By the end of the membership cycle (month 6, in this example), they would pay one final time to receive access to the remaining training tools. Then once that final month has been billed, no further content is provided and billing ends. There are many ways to create membership sites that can run on autopilot, or that require very little work. It’s entirely up to you how much time you spend on your website and whether you decide to create most content upfront and limit its cycle, or develop a continuity website that needs regular updates. You can also save yourself time and money by purchasing pre-made digital products from PLR membership websites that you can publish and charge access to. These require no upfront work whatsoever. Regardless how you decide to structure your membership site, one of the easiest ways to launch a website while ensuring that your content is protected is with Product Dyno. Product Dyno works for every type of digital product imaginable. It’s also easy to set up so it protects a single digital product, or power up an entire membership site with recurring billing. It’s a flexible yet powerful product enabling you to host all your pages via Product Dyno, or use your own domain. I highly recommend checking it out if you want to simplify the process and get started quickly. One of the easiest ways to generate passive income is by publishing books on Amazon. This is something anyone can do even if you’re not a prolific writer. In fact, you can easily outsource a combination of low content books as well as Kindle based fiction or nonfiction content and then publish them instantly on Amazon KDP. Self-publishing is a powerful, yet simple way to start building income on total autopilot. Once you’ve published your books and created an optimized book page that drives in readers, you can virtually set and forget your listings and they’ll continue to generate royalty checks every single month. If you aren’t familiar with what low content books are, think about journals, planners and organizers. Journals are extremely popular in countless niche markets and very easy to create. In fact, you could have hundreds of low content books published in a matter of days with very little upfront costs involved. If you’d like to find out about a proven way to create profitable low content books without lifting a finger, check out http://www.LowContentMastery.com where you’ll be able to gain access to a fully-loaded training course that includes all the tools you need to get started. Start by providing writers with a smaller task, perhaps a 5k word short story to gauge their quality and reliability. If they pass the test, hire them to write longer books. There are countless tools available to self-published authors that will help them maximize exposure so that you can build a truly passive income channel, but did you know that your Amazon author central page is one of the most valuable marketing tools of all?